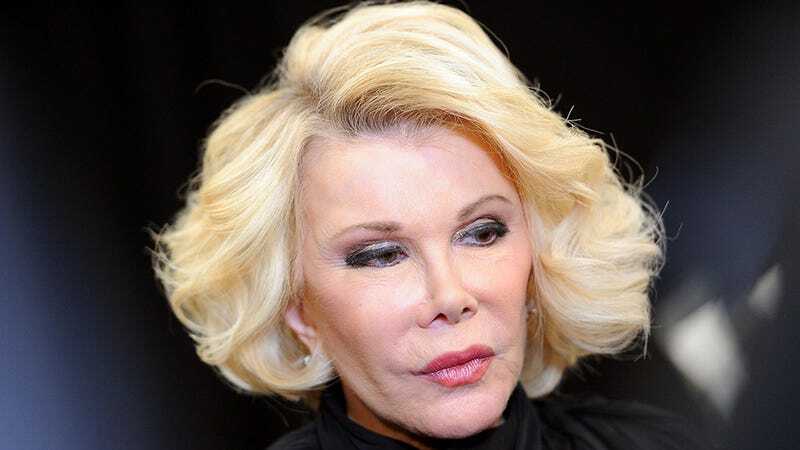 Remember how Joan Rivers was left out of the In Memoriam tribute at the Oscars last night? Surprisingly, that made a lot of people angry. Even more surprisingly, the Academy has responded with a lame attempt to explain themselves. Whether you liked her humor or not, it's impossible to say that Joan Rivers wasn't a part of Hollywood. But now that she's passed it feels like no one wants her. Broadway didn't want to lower their lights for her until it faced a great deal of backlash and last night she was snubbed (along with Elaine Stritch — who should have been honored just for agreeing to do Autumn In New York) during the Oscars' In memoriam tribute. What gives? The Hollywood Reporter has a statement from The Academy, which is both laughable and, frankly, really disingenuous. "Joan Rivers is among the many worthy artists and filmmakers we were unfortunately unable to feature in the In Memoriam segment of this year's Oscar show," reads the statement. "She is, however, included in our In Memoriam gallery on Oscar.com." Uh, OK, except Rivers was an Oscars fixture. How are you going to have her on the red carpet year after year and then say that her being excluded had anything to do with "inability" rather than sheer "unwillingness." Regardless of how anyone felt about her humor, the woman was a legend and deserved to be included in every tribute this year. After so many years in the industry, it's insulting to both Rivers' memory and her family not to include her in a tribute dedicated to remembering those who made Hollywood. Here's hoping she's up in heaven roasting everyone's fashion choices just a little bit harder this year.